Named after an explorer and fur trapper who traversed this remote region in the 1820s, Jedediah Smith Redwoods is the northernmost of the four segments of Redwood National and State Parks, and the only one not including any part of the Pacific Coast. The park comprises 15 square miles of lush, hilly land bordering the Smith River, most of which is dark and densely wooded, containing large ferns, thick moss, colorful lichens, flowering azeleas and many other plants in addition to the giant redwoods. Numerous big trees grow close to the main road (US 199) and along the park's small network of footpaths, though much of the interior has no trails so is virtually inaccessible, due to the steep terrain and the thick undergrowth. Hidden somewhere south of the highway along the upper stretches of Clarks Creek is the secret Grove of Titans, home to some of the largest coastal redwood trees anywhere, but whose location is not publicized, and reachable only by off-trail hiking. 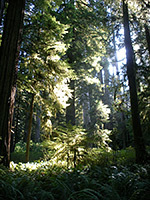 Because of the variety of the supporting plant life, the huge size of some of the redwoods, and the gaps in the canopy that allow shafts of sunlight to reach the forest floor (as this region is less affected by the sea fog that often covers the woodland closer to the coast), Jedediah Smith is considered to be the most scenic and atmospheric of the four redwood parks, despite being the least visited. Besides ample opportunities for looking at the trees, the park also offers swimming, fishing (principally for salmon, cutthroat trout and steelhead trout), rafting, cycling and camping. (see map below) Highway 199 from Crescent City enters Jedediah Smith Redwoods State Park from the west, passing several trailheads and a turn-off for the day use area/campground, for which an entry fee is charged, unlike all other sites which are free. The road bridges the wide but usually shallow Smith River, continues through the small village of Hiouchi then exits the park and follows the Middle Fork of the river eastwards for many miles. Two other vehicular routes in the park are the short, paved but narrow Warner Road that leads to a section of the river bank and to two trails, and the equally narrow and unpaved Howland Hill Road which follows a stream (Mill Creek) into the backcountry, within sight of countless impressive redwoods. US 199 is a busy two-lane highway edged in many places by trees growing right next to the carriageway, so roadside parking is very limited, and even the few trailheads have space for only a small number of vehicles. The nearest town with hotels is Crescent City, a few miles west. 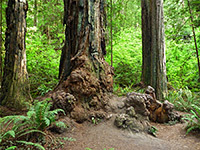 The best way for a quick introduction to the redwood forest is to walk along the Simpson Reed/Peterson Memorial trails, which together form a one mile figure-of-eight loop. The path crosses a small stream and winds through a very dense section of the woods, encountering all sizes of redwoods from young saplings to huge old growth trees. Some new trees are growing several feet above ground level, either on top of the many thick fallen trunks, or over the bark at the base of living trees, such is the richness of the environment. The forest shows some evidence of past fire damage, but not much, unlike the drier sequoia forests in the Sierra Nevada that are frequently affected by wildfires. Boy Scout Tree Trail - starting along the unpaved and narrow Howland Hill Road, this relatively popular, 2.6 mile trail climbs from Mill Creek Valley through several types of forest, passing many redwoods both large and small, and ending at a small cascade (Fern Falls) close to the west edge of the state park. Near the end, a spur path reaches the Boy Scout Tree - a conjoined redwood. Ellsworth Loop Trail - Ellsworth is the shorter of two interlinked loop trails through the forest north of US 199, reached by the narrow but paved Walker Road (RVs not allowed). The forest is quite overgrown and contains a typical mixture of old and new redwoods. Hatton Trail - the Hatton Trail begins along US 199, opposite the more popular Simpson Reed Trail. One short section loops round an overgrown redwood grove close to the highway, but the main path leads east, climbing the hillside well away from the highway into a more uniform redwood forest then becoming fairly level for a while (and closer to the road) before joining the Hiouchi Trail near the Smith River. 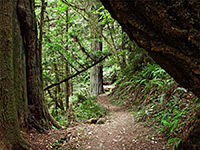 Along the way is a short spur to a small cluster of slightly larger redwoods, the Lohse Grove. Hiouchi Trail - for 2 miles, the Hiouchi Trail follows the west bank of the Smith River staying fairly level and passing a variety of trees including a fair number of old growth redwoods. Access is from a small pull-out along US 199 immediately west of the river bridge. Leiffer Loop Trail - the Leiffer Trail is a longer continuation of the Ellsworth Loop, climbing a densely wooded hillside then returning across flatter land quite close to the Smith River. 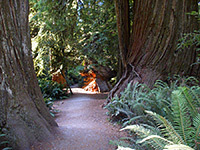 Some large redwoods are encountered but most are only moderate in size, and are mixed with many other types of trees and bushes. The two loops total 2.6 miles in length. Little Bald Hills Trail - the only route in the park which is also open to cycles and horses, this trail climbs steadily from the ferns and redwoods near the Smith River into mixed fir/cedar forest and then to open Jeffrey pine woodland at nearly 2,000 feet. 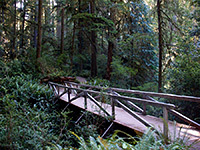 The trail enters a detached section of Redwood National Park after just over one mile, and eventually meets a track linking with the South Fork Road. Mill Creek Trail - the longest trail in the park (4 miles) runs along the valley of Mill Creek, always staying close to the stream, and generally on the opposite side to the Howland Hill Road that also traverses the valley. En route are many redwoods, though no particularly large specimens. 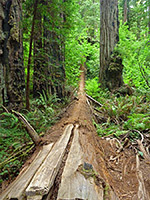 Simpson Reed Trail - Simpson Reed, and the connected Peterson Memorial Trail, is the most popular path in the state park owing to its short length (one mile), ease of access and the spectacular redwoods along the route. Stout Grove Trail - this short (0.6 mile) path loops around what some consider to be the most photogenic grove of redwoods in the park, situated on flattish land by the junction of Mill Creek and the Smith River. Like most places in the area the trees are mixed with ferns and a variety of other verdant green plants; tallest redwood here is the 340 foot Stout Tree. Access is from the Howland Hill Road or (in summer) via a footbridge over the Smith River, linking with the campground/day use area. Wellman Trail - on the east side of US 199, the 1.5 mile Wellman Trail loops around mixed redwood forest on the edge of a steep hill, mostly close to the highway and so affected by traffic noise. One short section of the Hatton Trail loops round an impressive redwood grove close to the highway, while the main path leads east into higher, more uniform forest. This short path tours perhaps the most photogenic grove of redwoods in the park, situated on flat land near the Smith River.